"Congratulations on a great Lenten Program. Loved it. Thought it was great. Very real and accessible for people. Love the photos, the extra explanation of the Triduum ... and the opening and closing prayers." Brian Collins PP, Resurrection Parish, Keysborough,Victoria. A Lenten program for a contemporary Australia. 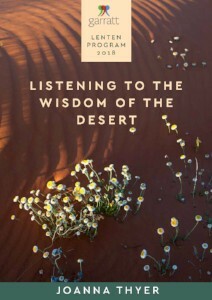 Listening to the Wisdom of the Desert is a modern Lenten program for group or personal study. Author Joanna Thyer has taken her theme from the first Sunday Gospel of Lent, Jesus's 40 days in the desert. Through six weeks she explores this theme using prayer, biblical reflection and modern stories. She asks: What is the desert in our own lives? What can we learn from it? To help with biblical reflection she provides a short introduction to Lectio Divina. Joanna Thyer has nearly 30 years experience as a writer. She was commissioned to write the Lenten programs for the Sydney Archdiocese between 1999 and 2001 and has written two self-help/spirituality books: Steps to Life and 12 Steps to Spiritual Freedom. Joanna also has degrees in Theology and Psychology and 23 years experience in ministry. She currently works as a University Multi-Faith Chaplaincy Coordinator, and also at CatholicCare coordinating a pastoral program for PLWHA. Joanna is committed to bringing spirituality to the community in creative ways. "To come together for respectful, honest, adult conversation and prayer in the light of the Lenten gospels is vital part of being Catholic today. This splendid programme provides a fine vehicle to nourish such important conversation.The mystery of Easter illuminates our passage from death to new life to be depthed anew each year. Rarely has it been so relevant." Mons Tony Doherty, former Director, Catholic Adult Education, Sydney. In his time his office published many successful Lenten programs. "Since the coming of Pope Francis, a continuing theme running through his shepherding of the People of God has been consistent, ‘Encountering of Jesus’. In these forty days of Lent the Disciples of Jesus are encouraged to go out into the desert with Jesus and meet ‘Our Father’ face to face. All that is required is simply going to that place in our hearts where we can encounter the Risen Jesus. Every Disciple of Jesus from time to time is required to do this and these Lenten days are just one of those tremendous opportunities. May we as Disciples journey with one another in these Lenten days of 2018." "Finally a Lenten Program that respects the ‘sensus fidelium’ incorporating sound principles of adult faith formation and growth in mature Christian discipleship. “Listening to the Wisdom of the Desert’ is a contemplative meditative reflection in response Pope Francis’ reminder of the importance of dialogue and diversity. Participation in its readings and noteworthy exquisite and provocative questions for faith sharing will no doubt lead to being transformed this Lenten season. A gentle program in response to a messy and suffering world where many are asking not only ‘Who cares?’ but more so does God care? Will recommend this program far and wide. Having given up on Lenten offerings the past decade this one will nourish my soul."